Price range varies between rs. 9 to Rs. 35 Based on buyer requirements. Manufactures and exports welded wire mesh & reinforced fabrics in 3. 2 mtr width & 12mm wire dia, in square, rectangular & angular dimensions from 6mm to 300 mm opening. Specialised in stainless steel, m. S. , g. I & any other metals & grade. Straightened wire rods from 1mm to 12mm in any metals & accurate lengths. Pickling (acid cleaning) of wires, meshes, sheets, rods in tank of 11' x 11' x 1'. Welded Mesh is one of the most versatile of industrial wire products and has innumerable applications throughout all types of industry. 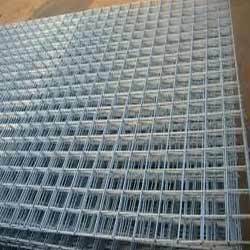 Backed by rich industrial experience of 38 years, we have marked a strong foothold as a prominent manufacturer and supplier of Fencing Wires, Wire Mesh Items, Quarry Screen Mesh, Wire Mesh Products. Our product range comprises Hexagonal Netting, Conveyor Belt, Square Wire Mesh, Vibrating Screen Heavy Wire Mesh, Expanded Metal, Chain Link Fencing and Barbed Wire. Moreover, we are also engaged in manufacturing Perforated Metal Sheet, Architectural Wire Mesh, Woven Wire Screens, Self Cleaning Harp Screens and Piano Wire Screens. These products require low maintenance & are extremely abrasion-resistant. In addition to this, our organization also provides Industrial Wire Cloth and Welded Wire Mesh to our clients. We use the finest quality of steel and aluminum to manufacture these products. This raw material is procured from prominent market vendors, by our raw material procurement agents. Moreover, our products are tested on numerous parameters like durability, strength and finishing. These are used in various industries to serve different applications. Moreover, we provide our clients with customization facility for our range, at industry leading prices. In order to make transaction easy for our clients, we have provided them with convenient payment modes like cash, cheque and DD. Furthermore, our warehousing unit is well-connected with all the major roads for transporting our products within the stipulated time frame. Owing to these factors, we have gained a huge clientèle all over India.